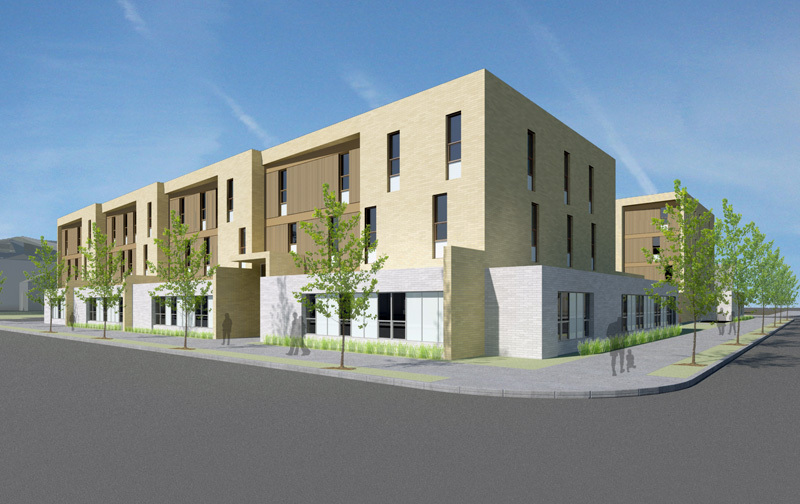 Home Forward partnered with LifeWorks NW on a development in Northeast Portland that provides permanent apartment homes with supportive services and expands a culturally-focused residential treatment program, Project Network. The development's 32 permanent apartments, which are reserved for graduates of substance abuse treatment programs, represent Home Forward's first "dry" housing program. The development also is part of the agency's efforts to preserve public housing by replacing former single-family public housing homes with more cost-efficient apartments in multi-family buildings. 29 studio apartments and two three-bedroom suites will be part of the residential treatment facility owned and operated by LifeWorks NW. 32 one, two, and three-bedroom apartments owned and operated by Home Forward will provide permanent supportive housing for graduates of drug and alcohol abuse treatment programs. Project Network is a LifeWorks NW program that provides extensive treatment services for women recovering from alcohol and drug use. More than 75 women receive treatment each year, and most are involved with both the child welfare and criminal justice systems. The average stay in treatment is six months, with a goal of transitioning to permanent supportive housing. Graduates from treatment programs living in Home Forward's apartments will be able to be reunited with their family members in a supportive dry community. Resident services staff will provide ongoing support. A multipurpose room and computer stations will be available for training and education.